LOS ANGELES (BP)—The Los Angeles Dodgers have returned to the National League championship series (against the St. Louis Cardinals), their first appearance since 2009. Earlier this season, they joined the 1941 New York Yankees and the 1942 St. Louis Cardinals for the best 50-game stretch in major league baseball history: 42 wins and eight losses. Clayton Kershaw—an ace among aces on the Dodgers’ pitching staff— led the league with a 1.83 ERA and 232 strikeouts during the regular season. Indeed it does—in more ways than one. 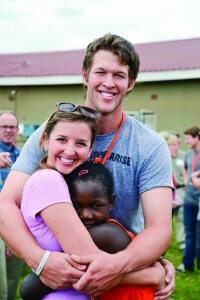 This season, Kershaw, an outspoken Christian, has launched the #Pitching4Purpose campaign to raise funds for Kershaw’s Challenge, a charity he started with his wife, Ellen, in 2011. Kershaw’s Challenge has formed partnerships with charities in Los Angeles and Dallas, but the bulk of its work is in Africa. Last December, it celebrated the opening of an orphanage in Zambia, which provides 10 children with the basic necessities and the Gospel. Kershaw’s Challenge has raised more than $107,000 this season after pulling in more than $220,000 in 2012. Kershaw donates $500 for every batter he strikes out. 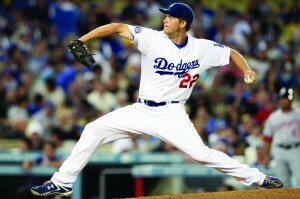 Kershaw said that inspiring others to get involved is more important than the money he gives to the cause. Last fall, Kershaw received the Roberto Clemente Award, Major League Baseball’s top humanitarian award. He was only 24 years old at the time—by far the youngest recipient ever. Kershaw called the award a “huge honor” that also helped recognize the work of his wife, who is involved with Kershaw’s Challenge full time. Kershaw grew up in a Christian home, but said he didn’t know what it meant to follow Jesus until he reached high school. In 2008, two years out of high school, Kershaw arrived on the big league stage, where he says living out one’s faith often takes on a different look than for the average person. Kershaw said he wants to be known as a Christian who happens to play baseball, not as a baseball player who happens to be a Christian.